If you read what the blog members have written here, over time you will find a wide variance of opinions. Some people are strong feminists; others are skeptical of or hostile to feminism. Some are adamantly pro-life; others are just as profoundly pro-choice. Some are quite supportive of expansionary activist government; other people look askance at increased executive authority. Some are anti-war; others support increased drone strikes at America's enemies. Some people are gung ho about gay marriage while others think that linking gay issues to black issues is somewhat opportunistic and ahistorical. Some people's views evolve or change over time; others remain as rigid as Mount Everest. And so on. In short, just like every other black person in America, the black people on this blog have different views on different issues. And that's also reflected in and among the blog readership regardless of race or gender. That should not be a surprise to anyone. Occasionally you will hear some conservatives (usually but not always white), express frustration and even outrage that in presidential elections, the black electorate usually supports the Democratic candidate. In fact since 1964 the Republican Presidential candidate has struggled to get more than 10% of the black vote and sometimes has gotten as little as 3-4%. Such conservatives wonder then since black people also tend to show greater levels of religiosity and occasional adherence to "traditional values" why more black people don't vote for conservatives, especially social conservatives. There is a very easy answer to this which is embedded in the picture at the top of this post. The post-Goldwater modern Republican party has made peace with and actively sought the vote of numerous whites who, as Democratic pollster Stanley Greenberg first noted in his landmark 80s study of Michigan Macomb County Reagan Democrats, often have a profound distaste for black people and any public or private policy they think is likely to help black people. In a follow up recent focus group study on tea party conservatives and evangelicals and their attitudes about the President and the shutdown Greenberg found that race was still key. We expected that in this comfortable setting or in their private written notes, some would make a racial reference or racist slur when talking about the African American President. None did. They know that is deeply non-PC and are conscious about how they are perceived. But focusing on that misses how central is race to the worldview of Republican voters. They have an acute sense that they are white in a country that is becoming increasingly “minority,”and their party is getting whooped by a Democratic Party that uses big government programs that benefit mostly minorities, create dependency and a new electoral majority. 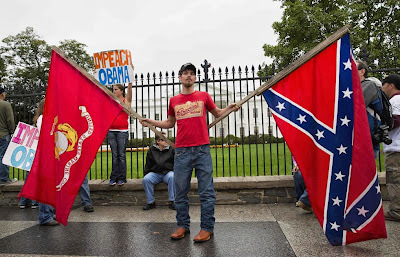 Barack Obama and Obamacare is a racial flashpoint for many Evangelical and Tea Party voters. This hostility to black people flows through conservative thought. 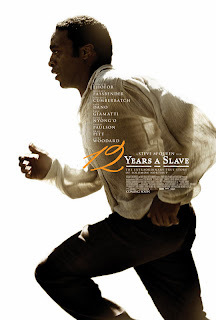 And as history is often just propaganda by other methods this animus has attached itself to the new film 12 years a slave. Investors Business Daily, a rabidly right-wing paper claims that much of the film is exaggerated, a white man wrote the book to try to start the Civil War, slavery wasn't that bad and that all this film will do is get the Negroes riled up. Seriously. But historians suspect much of the story — which recounts cringingly graphic tales of skin-stripping floggings and paddle-breaking beatings — is apocryphal. They found the book was actually written by a white abolitionist who exaggerated slave mistreatment as part of a propaganda effort to bring about the Civil War. To assure the historical accuracy of the film, producers hired Harvard professor and civil-rights activist Henry Louis Gates Jr. You may recall the name: He's the Friend of Barack who cried racism after police detained him at his Cambridge townhome a few years ago, inspiring the famous White House "beer summit" between the president and the cop he called "stupid." Predictably, Gates doesn't question the veracity of the slave memoir. Slavery and Jim Crow were bad enough without Hollywood fictionalizing what actually happened in order to further a political agenda. Distorting reality only fans the flames of racial hatred. Hollywood should be careful not to give creative license to racial arsonists who leave truth on the cutting room floor. This isn't quite the same as Holocaust denial but it's in the same universe. Hollywood usually puts out a Holocaust/WW2 movie about every five years or so. There are books about it released more frequently. Not counting Pat Buchanan can you think of any prominent conservatives who will publicly question if the Holocaust was really that awful or if a movie about the Holocaust ought to have showed the human side of an overworked SS Sturmbannfuhrer, who after all wasn't that bad if you got to know him. Probably not. The Tea Party candidate for Mississippi Senator is seeking the support of the Sons of Confederate Veterans. Mississippi State Sen. Chris McDaniel (R), the recently announced primary challenger for Sen. Thad Cochran's (R-Miss) Senate seat, spoke at a neo-Confederate conference in Laurel, Mississippi in August, according to Mother Jones. The conference was hosted by the Jones County Rosin Heels, a local chapter of the Sons of Confederate Veterans. Invitations for the event described it as a "Southern Heritage Conference" intended for "politically incorrect folks." Actually, Mother Jones also noted, that event was the second Jones County Rosin Heels event he recently attended. 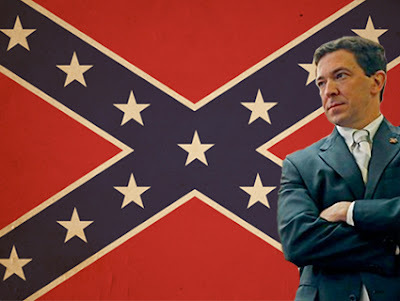 In June McDaniel was the keynote speaker at the Division Reunion in Jackson, also hosted by the Jones County Rosin Heels.The Jones County Heels have been pretty clear about its secessionist sentiments, Mother Jones further noted. The group's newsletter said in September said that "we are living in the times that Jefferson Davis predicted would one day come" where the disagreements that resulted in the Civil War arose again. And lastly just as I was finishing this post a North Carolina GOP Precinct Chair was forced out for among other things complaining that whites couldn't say "n*****" and boasting that if the new voter id laws would "hurt a bunch of lazy blacks that want the government to give them everything" that was fine with him. There's more but I think the point is clear. I do not think that every Republican is racist. That's obviously not the case at all. But the Republicans as a group have jumped in bed with some very ugly people. Like anyone else who's made some questionable social decisions, they're infected with something that's not so easy to get rid of. Until Republicans can find the political equivalent of Valtrex, most black people, even if they really really LIKE the idea of low taxes, limited government, unlimited corporate power, no social net, strong military, and traditional social values, are going to reject any Republican seductions during Presidential elections. Many* black people finding themselves on the same side as people waving the Confederate Flag and yelling the South's gonna do it again, are going to immediately recheck their mapquest and get back on the highway.